Close related to the Major Scales are these arpeggios based on Major triads (three-note chords). Arpeggios are for example used for melody lines and solos. 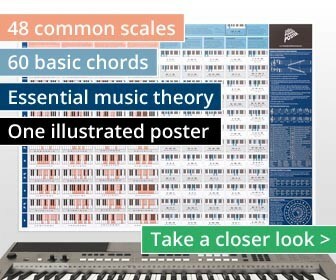 The pattern shown in the diagrams below can be played all over the keyboard. Arpeggios are similar to scales, but could be seen as more melodic and more colorful.